Once I had my permit the next phase of building my dream home began, razing the old cottage. I had considered two routes for getting rid of the cottage: burning it or tearing it down with a backhoe. I chose the latter so that I did not have to involve the town fire department. Also, the cottage was fairly small. It was only a one story 22’x30’ building. The process of razing the cottage involved three major tasks, removing all of the old furniture and contents from it, tearing it down with the backhoe, and then trucking off the debris. Fortunately the backhoe contractor was able to connect me with a company that could handle the proper and safe removal of the debris. It can otherwise be challenging to get rid of house construction debris as there can be hazardous material in it. In the end it took several 20 cubic yard dumpsters to get rid of the debris. However, it was amazing how fast the razing of the cottage was. In just a few days it looked like a home never existed on the property. All that remained was a dirt footprint of the cottage. As soon as the cottage was gone, the excavation contractor and I staked the exact corner locations for my new dream home. It was at this time that the realization of a long time dream was finally coming to fruition. It was an exciting moment for me. I spent quite a bit of time with both the excavating contractor and the concrete contractor to make sure we were all clear on not only the location of the home, but also the foundation wall heights and step downs/jogs, the gravel to be poured into and around the foundation footings, and the perimeter drain system. Lastly, we discussed water sealing the outside foundation walls prior to backfilling. The home style I chose to build was a large modern cape design where the waterfront side of the home had a wall of windows. This same side of the house also had what is referred to as a prow front. 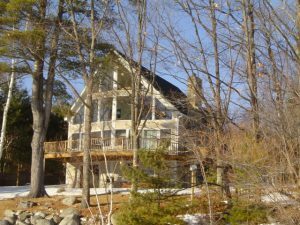 The design consisted of a walk out basement to the waterfront, a full first floor, and a two thirds upper level floor where three bedrooms were located, one being over a finished garage that was tacked on to the back of the main home. Within just a day the excavating contractor had dug the foundation hole. Two days later the footing forms were installed and the concrete poured into them. The footings were 18 inches wide by 12 inches deep and sat on compacted gravel at the bottom of the foundation hole. In addition to the poured footings, there were also concrete pads poured for the lally columns. Due to the fact that it was early January and extremely cold, Calcium Chloride was added to the poured concrete to enable it to cure slowly and prevent it from freezing. The tops of the forms were also covered with thick blankets to again prevent freezing of the concrete prior to it curing. Within a week the foundation wall forms were up and poured concrete was curing in them. A week later the outside foundation walls were sealed with tar. And at that point, it was time for the actual framing to begin. However, three weeks after the foundation walls had time to fully cure I called the excavator back in to install the perimeter drains around the foundation and to backfill around the foundation. He had to take some extra care during the backfilling to prevent from dropping large frozen pieces of soil into the foundation hole and possibly cracking the foundation walls. With the foundation walls up I called in my framing subcontractor. Note, I had called him two weeks earlier to give him the heads up that I would need him shortly. I had also contacted the building materials supplier and scheduled the delivery of material on the site. Initially just the framing lumber would be delivered. Then, after the walls and roof were built I would have the doors and windows, along with the house siding and shingles, delivered. You never want to have all the building materials delivered to your jobsite at once. Letting expensive doors and windows sit longer on a jobsite than they need to be is just asking for damage or theft to occur. It is important to note that I had visited the building materials supplier several times earlier to review my bill of materials and to order long lead items such as windows and doors. The framing stage is the most exciting phase of any construction project. It was when I could finally begin to see my dream home coming to fruition. The framing phase also goes much faster than one could imagine. In just a week the bones of my home were standing above the ground. After two weeks the roof rafters were going up and the home was finally taking full shape. I was convinced at that point that the building of my dream home would be completed well before my schedule. Naively I was quite wrong. The framing phase of a home building project is also the most costly phase of the project. Besides just paying off the excavator and foundation contractors, this is the time when you need to cough up large sums of money for the building materials as they are delivered to the jobsite. In addition, you need to start making payments to the framing contractor for his crew. The framing phase is also the important time to pay very close attention to the work being done. More specifically making sure the home is being constructed exactly to the building prints. In a number of cases I had to point out to the framing contractor errors in his work relative to the building plans. Fortunately I caught the issues early on so that there was minimal angst between the framing contractor and me. Good communication skills and tact is certainly important during this phase of the home construction. You want to check up on the framing, however, you don’t want to be a pain in the neck to the framing crew. As a result, I typically showed up on the jobsite at the end of the day after the crew left and checked what was done. I made notes of any issues I discovered and would visit the jobsite the next morning if I needed to bring any issues to the framing subcontractor’s attention. If I did not find any issues I left the framing contractor alone so that he could complete the job as quickly as possible. It is also important to note that just prior to the framing crew and building materials showing up to the jobsite I had my homeowner construction insurance policy activated. This type of insurance protects the general contractor, me in this case, from jobsite injuries and theft. The cost of this insurance is very reasonable and well worth the investment. My father once was building a home and one of his contractors was discovered stealing building material from the site. It was the insurance company that my father had used that uncovered the fact that it was his framing crew that was stealing the material from his jobsite to build a camp up in northern New Hampshire. So not only was my father reimbursed for the lost lumber the framing crew stole, but he was also able to fire them and the insurance company prosecuted them. Though the initial framing moved quickly, being located in New Hampshire the dry cold late January weather took a turn for the worse. Just after the roof sheathing went up we were hit by a couple of major snow storms which stopped or slowed construction for about four weeks. Besides the snow messing up the jobsite it turned out that my framing crew also loved to snow mobile. Consequently instead of being at the jobsite on the non-snowy days there were often on the snowmobile trails for days at a time. I had to repeatedly call the framing contractor and demand that they show on the jobsite. Eventually they did, but not after having a few heated phone calls. By the end of February, however, my new dream home was buttoned up. The doors and windows had been installed and the roof shingled. As a result, I was at a stage in the construction of my new home to call in the electrician and the plumber to install the rough electric and plumbing. Though the house siding had not been done, it was work the framing crew could do while not conflicting with the plumber and electrician. This said, I began to experience the impact of having too many different trades on a jobsite at the same time. In Part 3 of “Building Your Dream House”, the Rough Electric and Plumbing get underway. Stay tuned………….